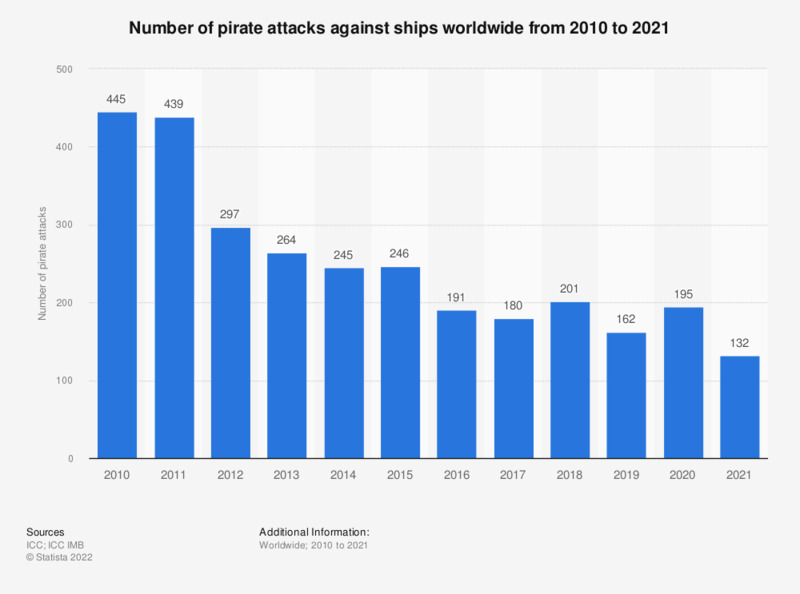 This statistic depicts the number of pirate attacks against ships worldwide from 2009 through 2018. There were 201 such incidents in 2018. Although the term “pirate” may conjure up images of bearded men with eye patches, wooden legs and parrots who were convicted and buried centuries ago, pirate attacks are indeed posing a threat to today’s shipping lines all over the world. Contemporary maritime piracy reached its peak level in 2010, with around 445 reported incidents. The regions most likely to come under threat from pirate attacks include Indonesia, the Philippines, and Nigeria. Here, pirates are attracted by the abundance of natural resources in the countries themselves or in adjacent areas. Strategic passages for oil transport such as Bab-el-Mandeb, near Somalia, or the Strait of Malacca off the Indonesian coast have become notorious targets for maritime crime. In 2009, oil tankers shipped 13.6 million barrels of oil per day through the Strait of Malacca; this exceeds the daily volume of oil imported into the whole of the European Union. With oil prices then hovering around 70 U.S. dollars per barrel in 2018, the hijacking of a crude oil tanker sounds like a promising deal for pirates. In 2017, Venezuela was thrust into the limelight: Here, the number of incidents rose from five to 12 between 2016 and 2017. It is often the crew and the pirates themselves who pay most dearly for maritime crime. In Somali waters, at least 149 crew members were held hostage in 2011, and over 100 pirates were killed - mostly by naval forces such as armed guards, who are increasingly seen to be of central importance to the protection of merchant ships. Incidents include actual and attempted attacks. The figures for 2009 to 2013 are taken from a previous edition. Everything On "Pirate attacks" in One Document: Edited and Divided into Handy Chapters. Including Detailed References.